The dreaded freedom fighters, otherwise known as the Niger Delta Greenland Justice Mandate, have unleashed yet another havoc on a major crude oil delivery line belonging to the Nigerian Petroleum Development Company in Delta State. The incident occurred on Sunday at about 11: 30pm around Ekuigbo, Ughelli North Local Government Area of the state. 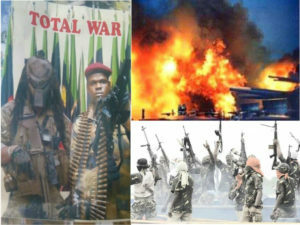 Spokesman of the militant group, Aldo Agbalaja, claimed responsibility for the attack in a statement issued on Monday. It described as “waste of resources” the use of military men to guard oil and facilities in the region, adding such would never yield any positive result. Ise Ise Ise... All hail Biafra!